History: Baby received her racing name, Stomping Child, because, even as a pup, she stood her ground if another dog tried to get in her face (that's quite a visual isn't it). However, she was the "runt" of the litter and her kennel name became "Baby". 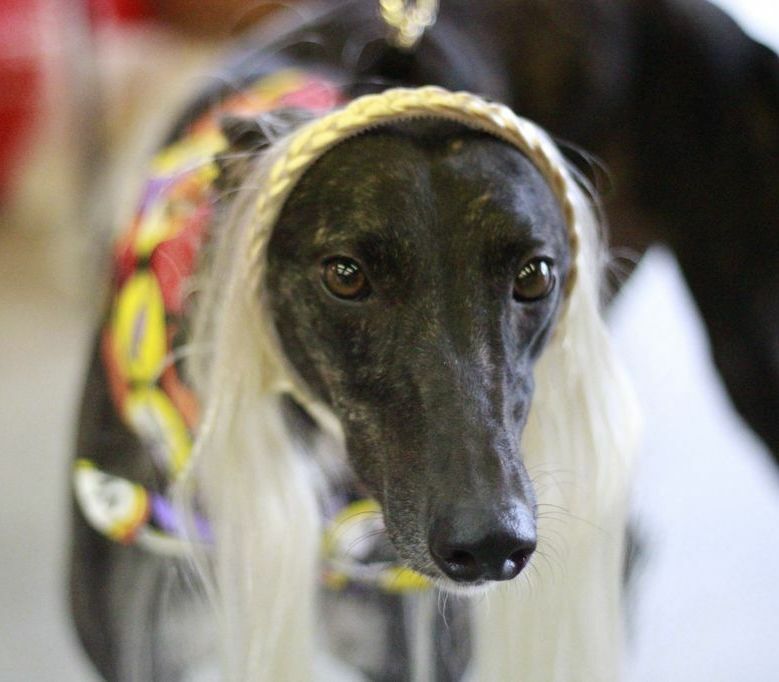 According to her breeder/trainer, she was quite fast, especially in the back stretch, but because she was so small there was a concern that the larger dogs would run over her. Therefore, she was never sent to the track, and her life has been spent on the farm. As a kennel favorite, she has spent time in the house and is already house trained. She has had some exposure to cats but will be more thoroughly tested in a TAGS foster home. Baby has also been around a human baby and both babies were fine. Baby is equally fond of men and women. 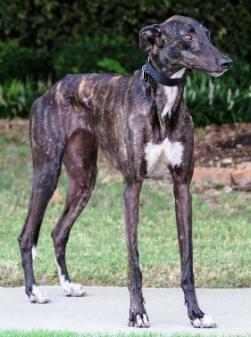 She is a striking petite very dark brindle beauty (with white back feet, white front toes and white blaze). You knew there had to be some Molotov in her. 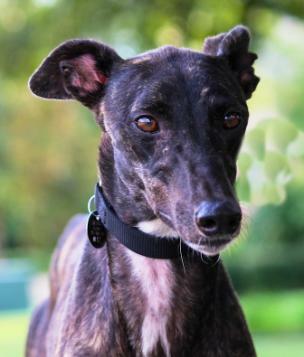 It won't take long for someone to fall in love with this sweet girl. October 19, 2012 update: Baby was adopted by her loving foster family today. 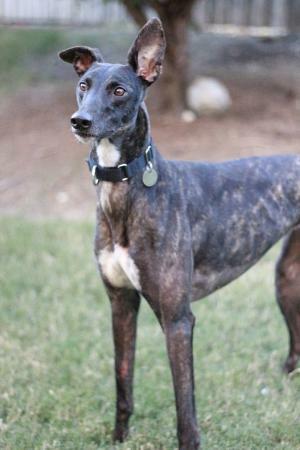 She has a Greyhound sister, Pistol, and 2 Italian Greyhound brothers, Ziggy and Toby and 2 kitty fur-siblings. Congrats to all! August 19, 2012 update: Baby is a 2 year old, sassy, feisty, ball of fun! Baby came to our house and had no trouble settling in. She loves attention from her humans and will stand and be pet for as long as you are willing. It’s especially rewarding when she looks at you and gives you a big smile. Her smile is SO sweet! She doesn’t show you her front teeth like some greyhounds, instead she pulls back the sides of her “lips” and you can see her back teeth. It’s super sweet! Baby lives with two cats and doesn’t even seem to notice they’re around. Her cat test was very uneventful! At night, Baby sleeps on a dog bed next to our bed, but she has been known to sneak up on the human’s bed when no one is watching. 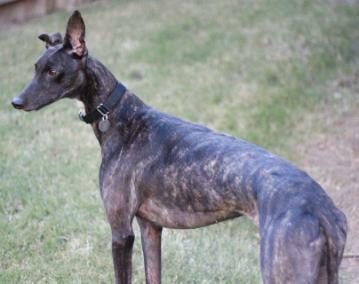 She also lives with two Greyhounds and two Italian Greyhounds. All of the dogs get along very well, but Baby does not like dogs in her personal space when she is resting on her bed. She will give a warning with a low growl. She doesn’t seem to mind humans bothering her while she is sleeping, but we would recommend that small children be watched when Baby is laying down. Baby is very food motivated and really enjoys her meals. She is easily trainable with a treat in your hand. She had no trouble learning our routine and hasn’t had an accident in the house. She’s the perfect house guest. 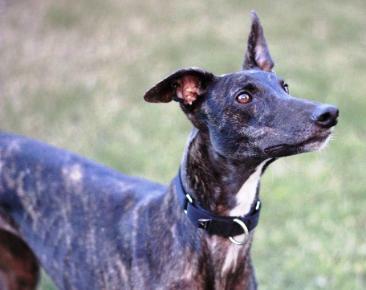 If you’re looking for a gorgeous, smart, spunky girl, this may be the greyhound for you! 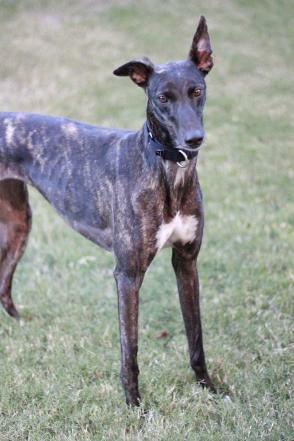 August 17, 2012 update: Baby starting a new life of retirement by coming to TAGS to find her lifetime home.